"The wealth in the home is, in most cases, wealth that is sitting idly when people have a hard time making ends meet on a day-to- day basis, so having access to that allows people to basically tap that cash to pay needs or to do more comprehensive financial planning," said Peter Bell, of the National Reverse Mortgage Association. "It sounded good," said Robert Bennett, a homeowner in Annapolis, MD. He and his wife Ophelia took out a reverse mortgage at the end of 2008 for about $300,000. They did it to pay off their regular mortgage and stop making monthly payments. At the time, the lender told them only Ophelia's name would go on the loan, as she was ten years older. The older the borrower, the less risk the lender takes on. "It was set up bad," said Bennett, "I wasn't thinking that-that I would be crossed out completely if she died." Bennett is now fighting foreclosure, trying to save the home he has lived in for nearly forty years. To stay, he would have to pay back the $300,000, but the house is now worth about half that, so he could never get a loan to cover it. Like millions of others, Bennett has no equity in his home. Experts argue reverse mortgages often are being used today for all the wrong reasons. Seniors now have less home equity, less savings, and more debt. 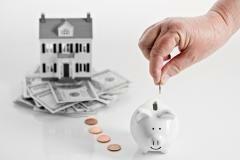 About 9.5 percent of the 775,000 reverse mortgages outstanding are delinquent, far higher than the rate on regular mortgage loans. While lenders are pushing them aggressively, fewer are being made today, due to the drop in home values. Advocates say they can be a valuable tool, if used correctly, and that there are ample safeguards. "The reverse mortgage, unlike any other financial service in the United States, requires every single borrower, prospective borrower to go before an independent third party reverse mortgage counselor at a HUD-approved, HUD-funded counseling agency prior to even making an application for the loan," claimed Bell. "So where somebody is coming off title would be in a discussion."